A firefighter was burned and one dog died in a house fire that erupted in Carlsbad Thursday afternoon. 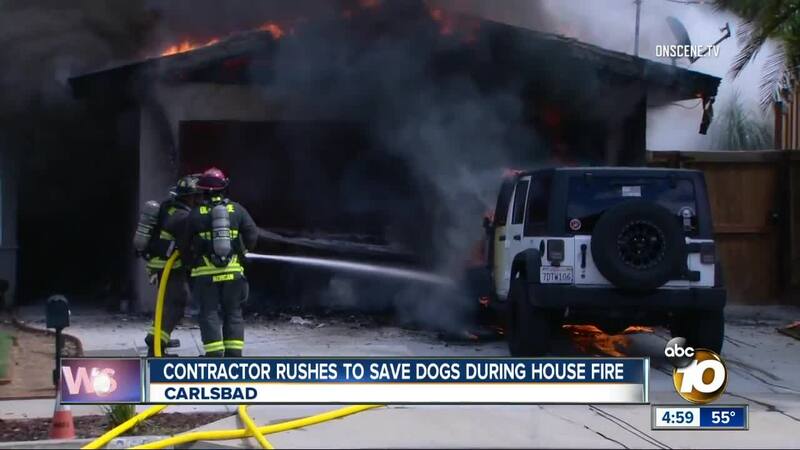 CARLSBAD, Calif. (KGTV) – A firefighter was burned and one dog died in a house fire that erupted in Carlsbad Thursday afternoon. According to crews, the fire broke out on the 3900 block of James Drive around 1 p.m. The blaze started in the garage and quickly spread to the rest of the home. A firefighter received minor burns battling the blaze. A witness who was nearby when the fire started broke windows to help rescue one of the three dogs inside the home. One of the dogs was able to leap out of a window while a second was rescued by firefighters and revived with oxygen. A third dog was unable to be revived and died due to its injuries. At this time, it's unknown what caused the fire.